Yesterday we introduced you to Amy Friend's By Hand collection--gorgeous prints that look hand painted in Amy's version of the rainbow. Starting today, we're going on a hop, showcasing what some of our designer friends have made with these fun fabrics. Take a sneak peek of the projects below and use the links to see more of each project. Each day, you'll also have a chance to win a fat quarter bundle of By Hand prints as well! Enjoy! "Amy's bright rainbow palette immediately drew me in! I wanted to make something that captured the light and dark combinations of each color in the collection, and I remembered pinning a technique for twisted strips. I say this every time I make a quilt, but this is my new favorite!" 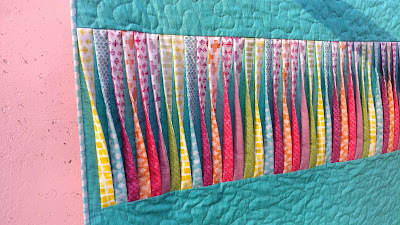 Visit Laura's blog to learn more about this cool quilt, see the pieced back, and enter to win a fat quarter bundle of By Hand. "I used By Hand to make a neat quilt for one of the baby boys in my life. I included all the teal, green, yellow and orange prints in the line, along with a hunter green solid. 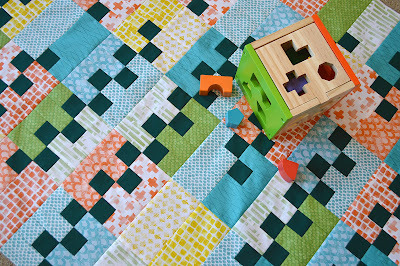 I designed this quilt just for these fabrics and it made such a happy and fun top! I'm calling this sweet quilt Inchworm, because the little asymmetric zig zags look like little inchworms crawling across the quilt." 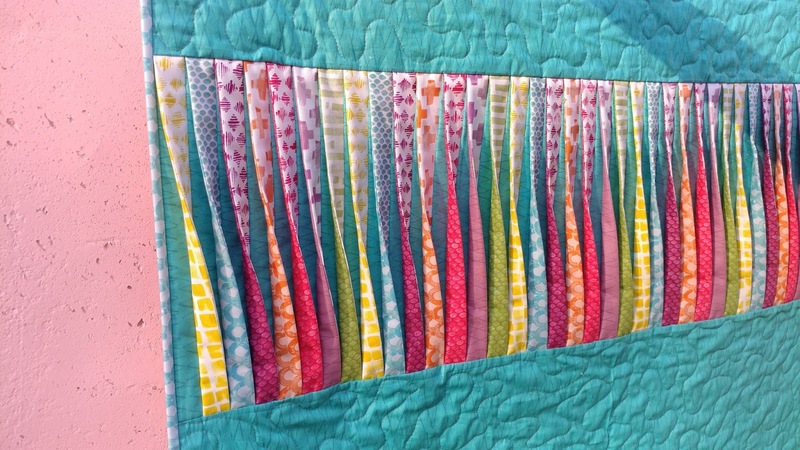 Visit Kari's blog to see more of this quilt and enter to win a fat quarter bundle of By Hand. Click here to see the entire By Hand collection. I really love these fabrics. Thank you for the chance to win some. They made very beautiful quilts. Thanks for sharing all this gorgeous eye candy! I love this fabric and what all the designers did with it.